Kolsch beer. Meet the style that easily converts those unfamiliar with it to raging fans. The more you drink it, the more you’ll like it. Kölsch is a clear German ale with a light golden color and mildly fruity profile. It forms a thick white foam and has a lighter body. It is gently bittered with Noble hops and overall well balanced. Its simultaneous softness and snap deliver a refreshing and utterly enjoyable drinking experience. It typically has a low alcohol content. 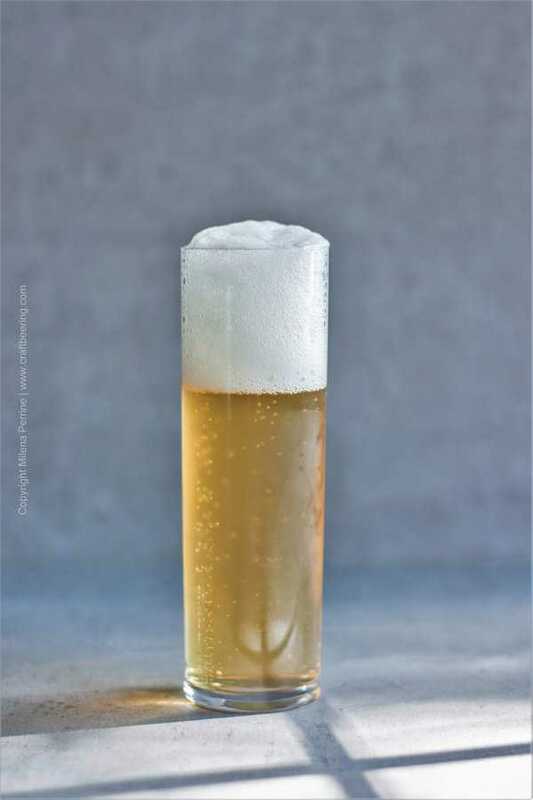 The Germans often say that Kölsch is a top-fermenting lager, because they use the word lagered to refer to a particular method of fermentation and storage in cold temperatures. Sometimes the style is referred to as a hybrid ale, on account of the specific nature of the yeast used to brew it. But Kölsch is not a hybrid. It is not a bit ale and a bit lager. Kölsch is a lagered ale. This simply means that it is fermented by a top fermenting yeast (ale yeast) but at cooler temperatures and then stored at cool/cold temperatures like a lager (i.e. “lagered”). Remember – the yeast is what drives the classification between ale or lager. Top fermented always means ale. Bottom fermented means lager. Kölsch’s yeast likes colder temps than generally warm loving ale yeasts. But this temperature is still higher than what bottom fermenting lager yeasts prefer. By lagers standards – the temperature is on the toasty side. By ale standards it is too low. But it is still an ale yeast. The umlaut symbol over the letter o in the name Kölsch signifies a sound that is between an o and an e. Kölsch is pronounced kœlʃ i.e. koelsch. The name of the beer comes from the German city of Köln (Cologne). It is not simply a name for the style of beer. Translated from German it means from Köln /with Köln origins. Just like Deutsch (German) means from Deutschland (Germany). It is also a dialect spoken in the region of the city. Hence it is frequently said that Kölsch is the only beer in the world that has it’s own language. Kölsch is an exquisitely crafted beer. A thing of beauty. It is one of the most elegantly aromatic, flavorful yet not taste bud arresting, refreshing, crisp, gorgeous beers you can ever taste. It is a very clean ale. My personal love for it is rivaled only by my love for pilsner. It has just enough fruitiness to engage, but is never overwhelming. The fruity-estery aroma is accompanied by a politely hoppy bite that counters a controlled malty sweetness. The rounded flavor leads to a dry finish. Mellow scents of honeysuckle, grass, earthy herbs, lemon zest make it extremely refreshing. Many knowledgeable German brewers will put it this way – the style falls between pilsner and helles. Kölsch is not as bitter as a pilsner and not as malty as a helles. Yet whereas pilsner is a lager and Munich helles is a variation of that lager, Kölsch as we established, is an ale. Only beer brewed in Köln (Cologne) and its immediate surroundings can be called Kölsch. The name is under legal protection and can only be applied to the top-fermented beer brewed in the specified region. A beer appellation for a controlled origin of sorts, formally called a protected geographical indication in Europe. The style is subject to relatively tight parameters in terms of how it should look, taste and how it is made. The breweries comprising the Brewers association in Köln are signatories to the Kölsch Konvention which aims to protect the style and specifies what goes and what does not. The members must adhere to certain ingredients and process guidelines in brewing the landmark style. Whereas there is a fair amount of leeway – the rules are clear, the rules are respected and the brewers are proud of the style’s heritage and quality. Such is the pride and so good the beer that the member brewers mostly work towards addressing local demand. More original Kölsch beer is being exported in the recent past but finding it in the US is still not particularly easy. Fortunately, there is a veritable proliferation of Kolsch style ales in the last few years here in the US. More on this follows. The name for the unique tall and skinny Kolsch glass is stange. Sometimes it is also referred to as a stick glass. A stange holds only 6.5 oz (200 ml) so imbibing the contents of a few glasses in a short time is more the norm than the exception. The shape of the glass showcases the clarity of the style and focuses the aroma for better enjoyment. Sometimes altbier is also served in a stange. To facilitate safely transporting multiple stange glasses the inventive people of Köln devised the kranz – a wreath shaped beer glass carrier. 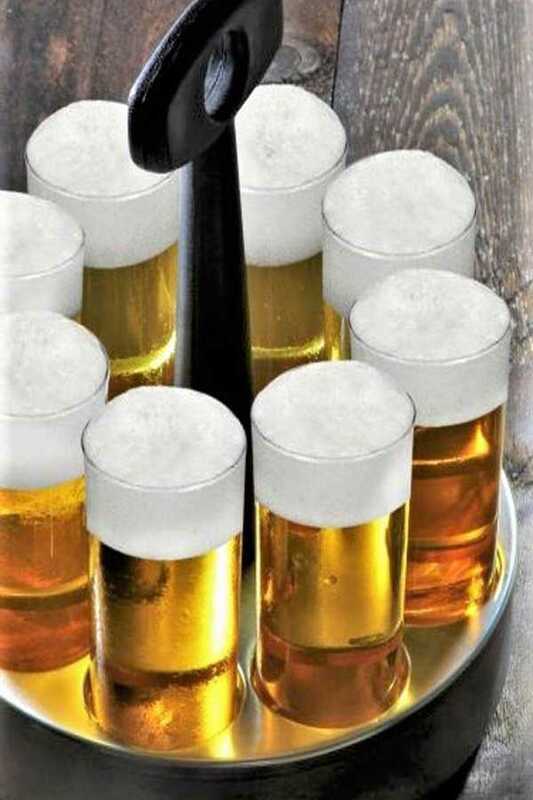 Traditionally, Kölsch is served by a Köbes. The male only servers called Köbesse (plural) are a link to the historical beer heritage of Cologne. They used to be brewery apprentices who were asked to help with serving in tap rooms to gain real world experience with handling people. They wore a uniform of a blue waistcoat, blue linen apron and a leather money pouch. Many of the large tap rooms still employ Köbesse and keep the tradition alive. In Köln when you order a beer, you are given a Kölsch. In fact the locals say “In Köln sagt man Kölsch statt Bier“ which means “In Cologne a person says Kolsch instead of beer“. 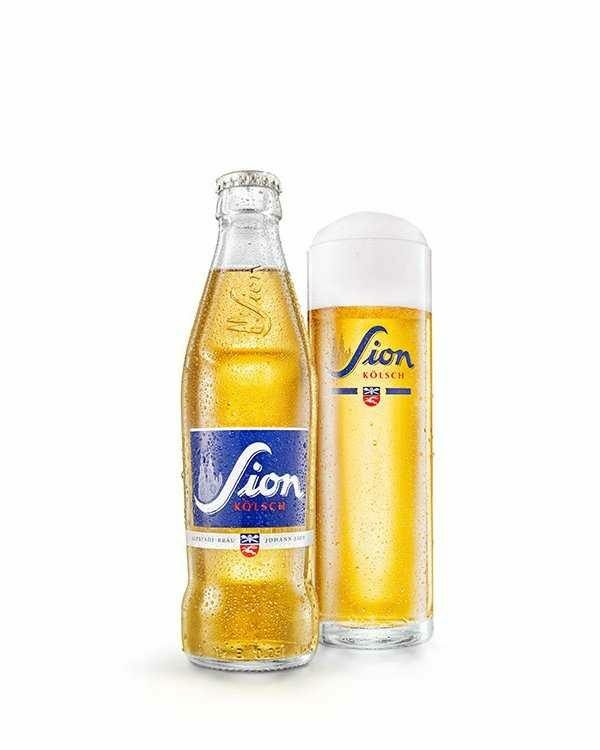 There are twenty-four breweries signatories to the Kölsch Konvention delighting their patrons with the highly carbonated, clear and dry signature beer. Here are several suggestions for beers and tasting rooms to visit if you find yourself visiting North Western Germany and stop by Cologne. What is the best beer, best breuhaus and brewery in Cologne? I cannot say. No one can. There are only subtle, often barely perceivable differences in the beer flavor. If visiting the city a good idea would be to go on a Cologne brewery tour and taste as many original examples as possible. Then you can find your personal best beer. The Kölsch Konvention is very clear on the allowable ingredients and methods to brew the style. Without delving into too much detail I will highlight the key things that comprise the style. The grain bill for a Kolsch beer is typically comprised of German pilsner or German pale malt from two-row barley. Some breweries add up to 20% malted wheat. Mainly Hallertau and Perle hops are used for bittering and Tettnang and Hersbrucker are the aroma hops. For the most genuine, true to style Kölsch the hops must be grown in Germany as differences in the soil impact flavor. It is all about the yeast when it comes to genuine Kölsch beer. Several strains of high-attenuation top-fermenting Saccharomyces cerevisiae such as the widely used German 177 strain are preferred to ferment the iconic brew. Some Kölsch brewers use their own proprietary strains. To derive the mild aromas fermentation in the 55 to 59 F range is advised and nothing to exceed 72 F. The yeast can produce strong off flavors at high temperatures. The water must have low residual alkalinity (i.e. be on the acidic side of the pH spectrum) as this really helps with achieving the pale golden color of the beer through controlling the level of tannins in the mash and wort. Low residual alkalinity also impacts protein coagulation and affects mouthfeel and bitterness. Specific guidelines are followed as to brewing the style with the end goal of producing the best possible brew. If you are interested in granular detail that at the same time is not over the top, I recommend this book. Kölsch has a turbulent history spanning many centuries. The same book I recommend above lays out the main events forming the story of the brew. If you read German, Kölsch: Geschichte, Brauhäuser, Brauhaus-Wanderwege by Hans-Günter Semsek has even more detail. Overall the first beers brewed in Köln for most of its brewing history were not even close to today’s straw colored and clear libation. The way the beer is known at present only goes back about two hundred years, notably improved in the last fifty years or so. 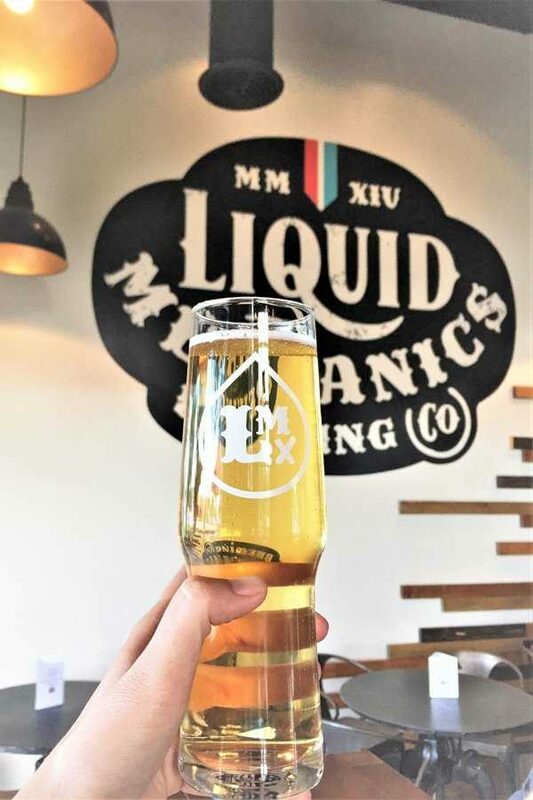 Below I’ve rounded up several Kolsch style ales we really enjoy – brewed in Colorado with mostly locally grown ingredients. Some of them closely adhere to the BJCP guidelines for Kolsch(page 23 in the pdf document we are linking to) while others are extremely loose in their interpretation. 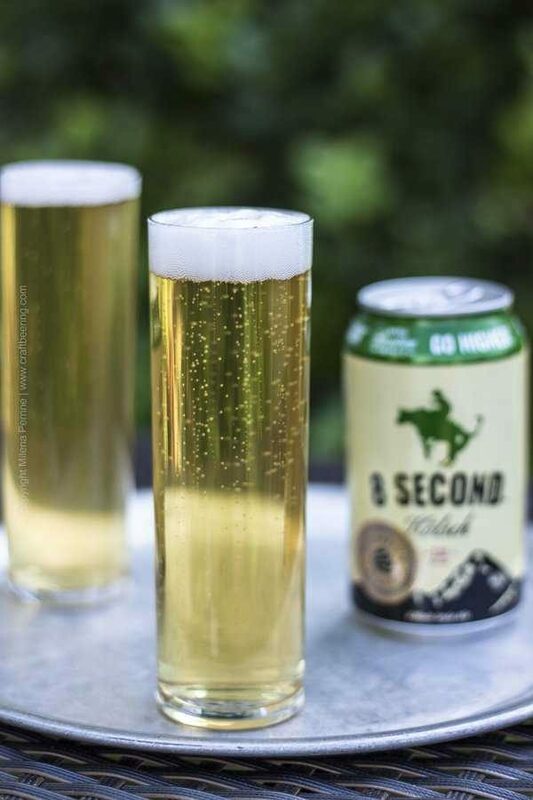 Our absolutely most favorite US example is Elevation Beer Co. 8 Second Kolsch. It tastes very true to style and we have never been disappointed by it. We also recently discovered the Liquid Mechanics multi-award winning Kolsch style ale with very, very light body and playful character. (2017 Best of Craft Beer Awards – Gold and a slew of other medals). 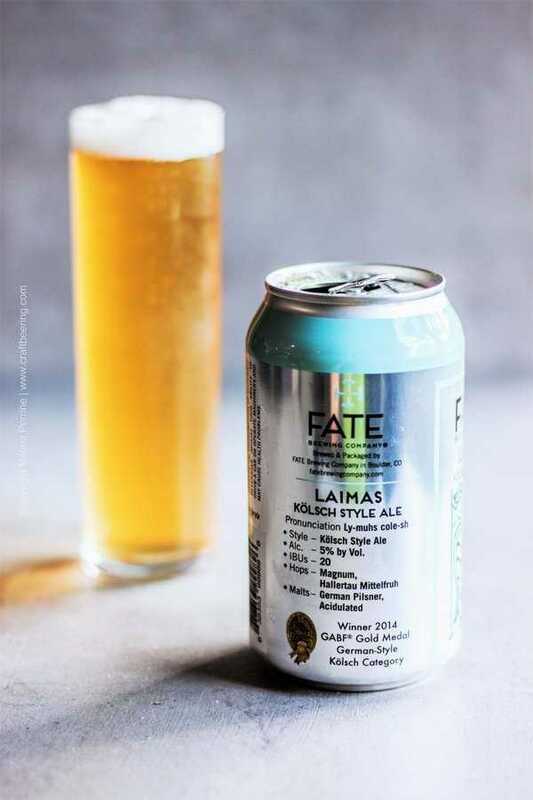 Fate Brewing Co. Laimas Kölsch Style Ale is a former GABF Gold medal winner. Then there are style interpretations that do not stop at alterations to the grain bill or throwing in a German hop not typically used to flavor the style. 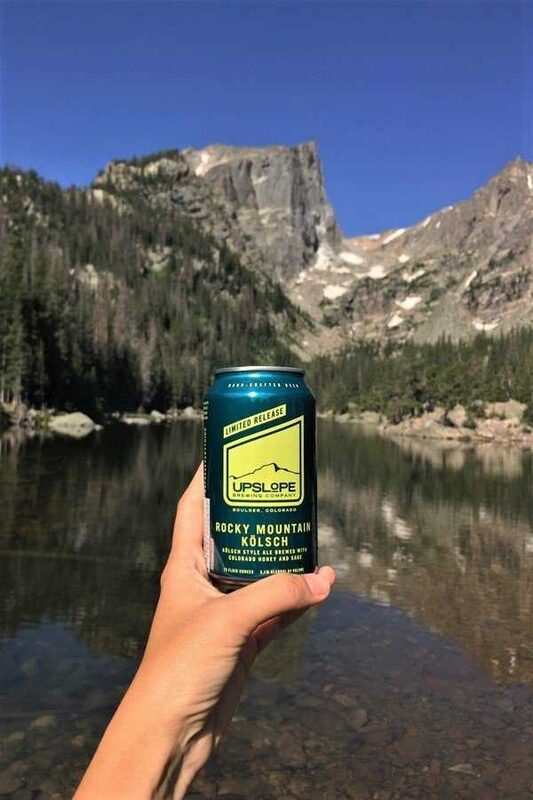 This Upslope Brewing Co. Rocky Mountain Kolsch Style Ale uses Mosaic and Lemondrop American hop varietals and flavoring agents such as sage, honey, fruit. It actually tastes nothing like a true Kolsch, yet uses the yeast. Since you cannot brew a real Kölsch beer unless you adhere to the strict ingredients and process guidelines and do so in the Cologne area you can try your hand at a Kolsch style ale. There are so many wonderful recipes out there. Below is Chris’ Peach Kolsch style ale recipe. Being fruit flavored it is perfect for summer. It still has the mild fruity bouquet from the yeast, but also an underlying peach presence (not sweetness). Chris makes a batch of it every August and we usually drink it all well before Oktoberfest begins in the second half of September. All grain recipe for Kolsch style ale conditioned with peaches. Perform a single-step infusion mash at 147°F. Use a thinner mash (approximately 3.75 gallons) to avoid over sparging and adjust the sparge water accordingly. Minimal splashing, avoid mash agitation. Boil for 60 minutes, following the hops schedule. Chill the wort to 65°F and pitch the yeast. Place in a 60°F fermentation chamber for 7 days. After 7 days rack the beer into secondary, add the frozen peaches and age at 45-50°F for 21 days. After 21 days remove the peaches, rack the beer and keg or bottle. If bottling, add priming sugar accordingly. 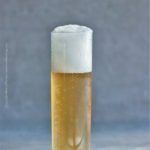 This article was written using the collective knowledge of Eric Warner, author of Kölsch – History, Brewing, Techniques, Recipes; Michael Berger author of the online resource Alles über das Kölner Bier (Everything About the Beer from Cologne); Horst D. Dornbusch, author of Prost! The Story of German Beer; Joshua M. Bernstein, author of Boot Camp for Beer Geeks and our own numerous Kolsch tasting, enjoying and brewing experiences – in Köln and beyond. Wow! The art of beer. What an interesting article. So many things to learn about beer. Cheers! I always learn so much from you! I had less than no idea what kolsch is before today. Could I call it the champagne of beers since it has to be brewed in a specific location? I love the sound of Chris’s peach beer. Apricot beer is a particular favorite of mine but I’ve never had peach–I could go for some right now! Thank you, Kelsie! Yes, it is pretty tasty with peach, but I also love apricot sours,mmm!